The skill of watermarking paper was a major attribute of Stowford Paper Mill. Throughout the mill’s 226 year history, its ability to provide high quality watermarks elevated its reputation and provided business opportunities worldwide. In the later years, having its own design and manufacturing capability greatly assisted the development and improvement of watermarking. With its ability to manufacture small quantities of paper, enterprises of any size were able to contemplate the use of bespoke watermarked stationery. In the security paper sector, the provision of high quality watermarks enabled the mill to participate in high profile projects and indeed ‘world stage’ events. a word taken from the French filigrane, meaning watermark, is the study of watermarks. From the humble tracing of an image, their study has expanded to include scientific processes, such as alpha- and beta-ray photography which permits watermarks obscured by print or manuscript to be photographed. This research often provides plausible historical relationships and background information such as the date and origin of paper based, written documentation and pieces of art. There are other practical uses, and on occasions, the mill was approached to authenticate sheets of watermarked paper relating to disputed legal documents in court cases. Some employees at Stowford Paper Mill received the ultimate bespoke watermarked paper! As a retirement gift they were presented with a couple of reams of paper bearing their own signature as a watermark, a truly unique leaving present. Some even had a miniature dandy roll with their watermark, a real memento from this unique paper mill specialising in the provision of watermarked paper. 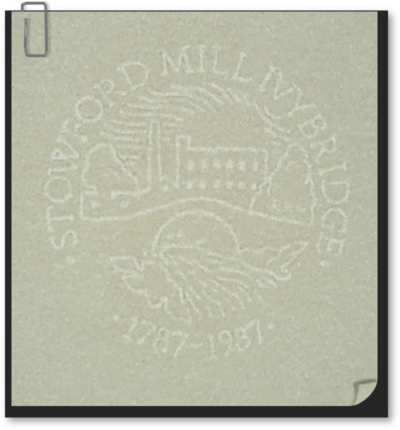 Whilst the principal uses of watermarks are to bring identity to business stationery and provide authenticity to security documents, Stowford Mill used them in a variety of other applications. Products ranged from light weight and soft feel laid watermarked diamond wrapping paper, for a leading Antwerp dealer, watermarked wine bottle labels for French producers, bespoke watermarked diary paper, one for a prestigious London based manufacturer, through to textured watermark picture mount paper which was laminated to card. In the late 1980s the paper mill embarked upon a special project to produce exceptional watermarks themselves, such was the importance of watermarking to the business at Ivybridge. 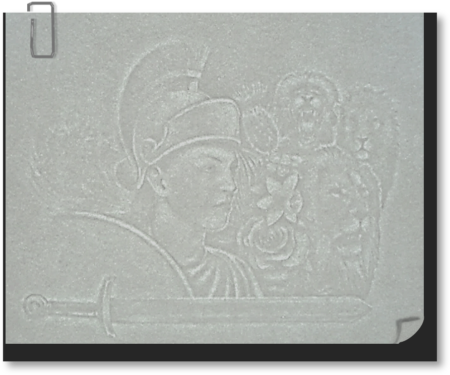 The principal method of producing high quality multi-tonal watermarks, was through the use of embossing plates bearing the watermark image. From an initial watermark design, heavy duty metal plates were engraved using specialised tooling in the purpose built workshop within the grounds of the mill. Each dandy roll could take up to 6 weeks to complete, as only a small area of wire mesh was embossed at one time. Often backing layers of mesh were required, which had to be snipped away in the areas of embossing and sewn together, before forming the layers into a cylinder to create a dandy roll. The flexibility of having its own watermarking workshop enabled the mill to embark upon all sorts of projects. Trials were conducted with themed watermarks, to gauge market reaction, whilst another project experimented with heavy watermarked designs for manufacturing wallpaper. The same principles brought an internal innovation award within ArjoWiggins, using such watermark designs to make fashionable paper carrier bags and packaging materials. Most people are familiar with watermarks given that we have been encouraged over the years to look for them as a means of authenticity in our paper banknotes and other important documents. However, few will appreciate just how they are created. The thickness of a sheet of paper, or the overall density of its fibres, primarily determines how opaque the paper will appear when held to light. A watermark is a design created in the sheet of paper when the mesh of fibres has been redistributed, creating variations in the thickness and density which translate to light and dark tones. The majority of paper manufactured today is of a wove finish, manufactured on Fourdrinier paper machines, employing dandy rolls to provide watermarks. The most common type of watermark is created by soldering metal dies (electrotype) to the dandy roll, the name of the cylinder used on the paper machine, so they appear proud of the surface. These dies are cleverly distorted to take into account the stretching which the paper endures on the paper machine, and the shrinkage, as a result of the difference in water content of the paper between where the watermark is created, and the finished reel of paper, following pressing and drying. This method provides the very recognisable light, translucent line watermark. An alternative type of watermark is the embossed, tonal watermark. Generally, two embossing plates are used to impart the image into the wire mesh of the dandy roll. A cameo (relief) and intaglio (recess) embossing plate, more commonly known as male and female dies, are placed either side of the wire mesh, which has been annealed (heated). This process softens the mesh, making it more pliable and susceptible to take the design of the embossing plates, whilst preventing the individual wire strands from breaking. Using a special industrial press, the design is imparted into the wire mesh. This process is repeated, until the whole length of the wire mesh cover which will form the dandy roll is embossed. An example of a single tone ‘Line’ or Electrotype watermark produced at Stowford Paper Mill commemorating the mill’s bicentenary in 1987. An example of a multi-tone Embossed watermark produced at Stowford Paper Mill to showcase its watermarking capabilities. Papermaking is one of the world’s oldest manufacturing industries, and in Europe at least, the history of the watermark runs almost in tandem. Although paper itself was an Oriental invention, it was European papermakers, with their rigid style moulds, who first began using thin bent wire to form watermarks in the thirteenth century. The earliest examples can be traced back to the paper makers of Cartiere Miliani Mill, at Fabriano in Italy. The first known watermark was produced in 1282, a Greek cross with circles at the cross-point and cross-ends. The very earliest European watermarks may have had some religious significance, but the marks quickly assumed other purposes. Some were the personal marks of the paper maker, serving perhaps to identify their individual work, or assist in the identification of moulds, which were commonly used in pairs. However, the Renaissance paper houses soon recognised them as a means to bring identity to their businesses, thus acting as early trademarks. Watermarks were later used to identify sheet sizes, mill locations and paper furnish. Today they serve to promote company identity through bespoke stationery and authenticate important documents such as banknotes and passports. The first mention of a paper mill in England appeared in the household book of Henry VII in 1498. Located near Stevenage in Hertfordshire, Sele Mill belonging to John Tate, provided paper to the printer Wynkyn de Worde who had worked with William Caxton. This mill produced paper with a watermark of an eight pointed Tudor Star. In 1781, a maximum legal size for papers was laid down in England which included Crown, Demy, Elephant, Medium, Pot, Post, Super Royal and Foolscap. In most cases these sheet size names can be traced back to watermark designs. Foolscap (13.5” x 17”) took its name from the jester’s head with a fool’s cap first appearing around 1540. It was replaced around 1750 by the Britannia. The Bank of England established in 1694 had a need to introduce watermarks in their banknotes following some well publicised forgeries. In 1724, Henri Portal was awarded a contract from the Bank of England to produce watermarked banknotes at his mill at Laverstoke in Hampshire. The advances in watermarking are inextricably linked with the progress and innovation in paper making. In 1797, a Frenchman, Nicholas Louis Robert had devised a machine to make a continuous web of paper. Robert worked at a mill located at Essonnes in France under the ownership of Francois Didot. This mill had operated since 1355 providing much of the paper used by the Ministry of France for the nation’s currency. After several trials a full scale paper machine was created. Due to some disagreements with his sponsors and the general state of affairs in France because of the French Revolution, Francois Didot contacted his brother-in-law, John Gamble to enquire whether he could raise sufficient funds to manufacture a paper machine to the Robert design. Gamble in turn contacted Henry and Sealy Fourdrinier, two stationers working in London who expressed great interest along with the agreement to help fund the venture. In 1801 John Gamble was granted the first English patent on a paper machine. John Hall, an engineer at Dartford, was asked to examine the original machine built by Robert with the intention of improving it. Bryan Donkin, a mechanic and apprenticed to Hall was then engaged to construct a paper machine which was completed in 1803 and installed at Frogmore Mill, Hemel Hempstead, funded by the Fourdriniers. Following Robert’s invention of the continuous paper making machine, there was a need to find a way to watermark paper on the reel. The original dandy rolls, the device invented to provide watermarks on a paper machine, consisted of a framework of lengthwise wooden ribs onto which round metal discs were attached in order to loosely support a woven wire fabric cover, to form a hollow cylinder. Later dandy rolls consisted entirely of metal. 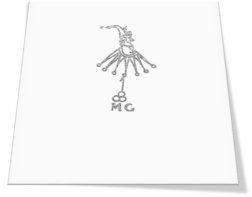 The watermark designs were originally tied on to the cover with fine wire. The invention of the ‘dandy roll’ is attributed to John Marshall of the firm T.J.Marshall of London, established in 1792. Mr Marshall did not file for a patent on his invention. The records of the Great Seal Patent Office include a patent granted to John and Christopher Phipps of Lower Buckland Mill in Dover, dated 11th January 1825, for a cylinder formed of wire to create impressions upon the forming paper. Neither John nor Christopher Phipps pursued the construction of their rollers. They passed into relative obscurity. However, John Marshall, in 1826, proceeded with the production of a similar roller, the name of which is said to have been bestowed upon it when a worker at Marshall’s establishment exclaimed “Isn’t that a dandy!”, a word of Scottish derivation meaning smart and fine. Whilst the principle uses of watermarks are to bring identity to business stationery and provide authenticity to security documents, Stowford Mill used them in a variety of other applications. 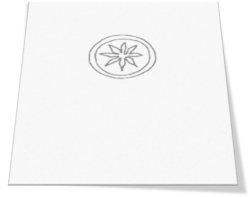 The principle method of producing high quality multi-tonal watermarks, was through the use of embossing plates bearing the watermark image. From an initial watermark design, heavy duty metal plates were engraved using specialised tooling in the purpose built workshop within the grounds of the mill. Each dandy roll could take up to 6 weeks to complete, as only a small area of wire mesh was embossed at one time. Often backing layers of mesh were required, which had to be snipped away in the areas of embossing and sewn together, before forming the layers into a cylinder to create a dandy roll. Some employees, for retirement gifts, were lucky enough to be presented with a couple of reams of paper bearing their own signature as a watermark, a truly unique leaving present.